Created 4 Creativity : Sweet! And for my local friends...enjoy the Scrapbook Convention which starts today in Arlington. Maybe I'll see you there. 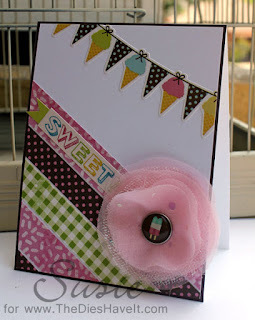 Until then, I want to share a tutorial I did on the Samantha Walker blog. Click right here to see how to make these soft fabric flowers using larger brads and a few lightweight fabrics. You will also get a look at Samantha's wonderful summer line called Cool Summer.